the Bavarian Inn – CLICK HERE for details! Re-Mix is a 6 piece variety band playing all your favorites. Re-Mix has male and female vocals, guitar, keyboards, sax, and drums. From the moment your guests arrive to the last dance of the night, Re-Mix will use their 28 years of experience to help make your night a worry free, special event. Whether it be your wedding, office party, festival, etc. Re-Mix plays all your favorites or specials requests with state of the art digital music during our breaks, making for a non-stop night of fun and dancing. Below are snippets from a few of the songs that we perform. 6 years in a row for the Bavarian Inn Lodge New Years Eve Party! Dean, what a great time! Remix was Superior, so many great comments about those guys in the end the lady the place was rocking. All four daughters now married off. Again thanks for everything you’ve done a fantastic job with everything that you’ve done for us. Party was great. Everyone complimented Remix and I think they did a great job. Dance floor stayed full. Everything went well and they were able to accommodate all of our requests including being set up and sound checked hours before they were scheduled to play. The caliber of performance was beyond what we expected and their exhibition helped make our wedding day amazing. Well prepared for concert site with their equipment and played the music song sets we planned for our audience type! Solid band with great vocals and wide range and mix of music indicating their talent and experience! Remix was excellent and exceeded all expectations. They worked with us from the very beginning. They were flexibility with all kinds of changes. They did a great job of covering the songs we asked for. The band even helped the bride’s family with a last-minute karaoke request. The Band was fantastic! we would highly recommend them to anyone. The quality if the music was top notch and the professionalism of the band was also. We received many compliments from the guests that night and were very pleased with them overall. Rusch Entertainment really came through for us on short notice and on a limited budget. Remix did a great job; they were timely, courteous and professional. We received a lot of compliments about them; they really made our reception a success. Thank you Remix! They couldn’t have been better. We had many comments on how good the band was and the volume we perfect. Thank you for making the wedding reception a complete success. Thank you so much for suggesting “Remix” and for working with us on the rate. They were wonderful! Our people were very happy and we received lots of compliments on our selection. They were great entertainment!! The Clio Fire Department, Inc. has employed the musical group “Remix” for the past two years at our annual homecoming festivities. It is with great confidence that we offer this testimonial to any perspective employers. During the past two years we have found the quality of performance, conduct of performers and ability to entertain our large crowds to be first rate. Their extensive repertoire has made them a favorite with the audiences and they have been one group that we have consistently been requested to hire back for the following year. We certainly intend to continue to have this crowd pleasing (and crowd drawing) group back next year. Volume was just right! I was really impressed with the performance of Remix at our wedding reception. Prior to the wedding we heard nothing but good about this band, and I’m pleased to say we hired them with confidence and they lived up to our expectations. Our guests were also impressed with this band, which is important in our overall satisfaction with our decision to hire Remix. Thanks for a night of enjoyment and memories!! You were terrific!! Very professional. I would definitely refer them! Seeing young children having fun was amazing. They played songs the children enjoy, also the older generation just loves this group. Lots of positive comments. All was very good! Thank you! We would like to give the highest of recommendations for Remix. We are familiar with their music abilities in a variety of ways over a period of several years. Remix have played at our staff Christmas party. Although a DJ or other possible groups are available at a lesser expense, the staff request is consistently for Remix. The feeling is that the possible additional cost is well worth the evening of music they provide. In other words, “you get what you pay for!” In the words of one staff member, “The music can make or break our one party of the year! Why go with any other group when we can have the best?” The staff has been known to change the date of our party to insure having Remix! We have also known Remix through numerous community dances. They have played at church festivals, little league dances, treasure hunt parties, and the fireman’s festivities. In addition, they have performed in our city amphitheater as hundreds of all ages clapped hands, sang along at times, and swayed to their music. Remix are responsive to all age groups and occasions. They seem to have a special sense in determining the interests and music needs appropriate for the occasion and for those in attendance. In particular we would like to share our experiences in having Remix play recently for our wedding. From the pre-planning to the conclusion of our wedding we were, without exception, extremely pleased with the group. They were timely in responding to our booking request. We felt they quoted us a very fair fee. The location of our reception required the band to set up 3½ hours before they would actually perform. Remix were very accepting and accommodating of this requirement. They were eager to grant music requests and offer to learn any songs they were not familiar with. At the reception they remained professional in not attempting unknown music unless they had practiced it. They were, as always, perfectly and professionally groomed for this occasion. One can tell they like what they are doing, taking well-deserved pride in what they do. Their enthusiasm was contagious, setting the stage for a perfect party atmosphere. Unlike the music at most weddings, which seems to cater to one age group at the exclusion of others, Remix was interested in appealing to all. They instilled confidence in us by taking as much interest in our guests as we had. When we were rained out of our courtyard reception, Remix, without hesitation or complaint, moved their equipment to a new location, giving their all to rescue what could have been the end to a wedding reception! We have had a great number of people compliment us on our choice of group. Many said they’ve never danced to better music. They are willing to devote more time if the party is still going at the end of the time contracted. They are very tolerant and professional in handling those guests who think they are talented enough to sing and play with the band! We cannot say enough good about Remix. We were in very competent hands with them. A few adjectives that first come to mind when thinking of the group are dependable, professional, excellent, and outstanding. They are highly skilled musically; a definite cut above all the rest. They were very easy to work with. Without the slightest hesitation we urge you to seriously consider Remix for an engagement. You won’t be sorry. I would like to express my EXTREME thank to the members of the band “Remix”. They performed and were absolutely fantastic!! Our committee has heard nothing but favorable comments about their performance, we were very pleased with their entertainment. They made our Beach Party a Success!! Thanks Again!! 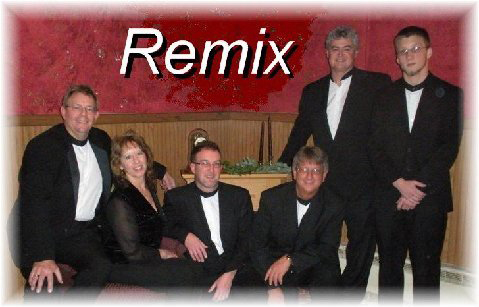 I am writing on behalf of the Chesaning Chamber of Commerce Board of Directors to tell you how totally satisfied we have been with the music provided to us by the band “Remix” which performed again this year at our Annual Dinner. They are versatile musicians who perform music which appeals to a wide variety of tastes. They were perfect for our event and earned such rave reviews that we booked them again for our next dinner. We would like to give the highest of recommendations for the Remix. We are familiar with their music abilities in a variety of ways over a period of several years. I would like to express my EXTREME thanks to the members of the band Remix. They performed for us at our ‘Beach Party’. It was a total success. Ever since our first introduction to Remix some six years ago, we have continued to book them year after year because of their smooth performances, versatility, and the ability to satisfy our needs whatever the musical occasion – Keep up the fine work! When the Remix came and played for us the first time the crowd response was so positive that we booked them that same evening for our next year’s banquet. I would like to thank your band for playing the fall Ceremonite. Your group played to the crowd. We can’t thank you enough for setting us up with Ross + Remix. They were wonderful and just perfect for Heather and Peters wedding on September 12th. They played quite the variety of music and they were enjoyed by everyone! Remix has been performing for the Bavarian Inn Lodge New Year’s Eve Gala for the past six years. We have been very pleased with their performance and interaction with our guests. The music selection is wonderful and the band members are professional to work with. We look forward to their return. Definitely a class “A” band. Remix played for our company party and brought professionalism from the start to the finish. Remix dressed professionally for the event and their equipment complimented their awesome talent. Bob on the sax was definitely a plus to bring the band a unique sound. Doug, Jana and Ross’s vocals were right on and the musical accompaniment was top notch. Kirk and Aaron on the guitar and drums didn’t miss a beat as they rounded out the group to a rich yet bold sound. The pre e-mails and phone calls to coordinate the event were handled bery professionally. If you want to see musicians enjoy their work … this is the band to hire. They were great! The event was my husband’s birthday, we had people of all ages, 2-80, and everyone commented on how good the band was. Most people danced and some sang along. The made the party a big success. Thanks! They were a hit. The music was great and they were very accommodating and easy to work with. They know what they are doing and enjoy it. I didn’t have to worry about anything when it came to the band. The band was fantastic! We would highly recommend them to anyone. The quality of the music was top notch and the professionalism of the band was also. We received may compliments from the guest that night and were very pleased with them overall. They were timely and adhered to our time specifications. Very willing to assist any way they could. Our crowd was happy and dancing! Thank you Remix!!! You made our wedding day so much more special. Everyone we talked to after the reception loved your performance. Remix was amazingly accommodating. They openly invited my family member to play his harmonica with them. We can not envision a better all around band for such an occasion. We will and already have recommended Remix to anyone looking for a band or those thinking they only need a DJ. Our wedding was based on a low budget, but booking Remix instead of a DJ was one of the best decisions we made. Thanks again for the great job and making our evening one we will never forget. Great people to work with. Great experience. Well prepared for concert site with their equipment and played the music song sets we planned for our audience type! Solid band with great vocals and wide range and mix of music indicating their talent and experience. My experience with Remix was fantastic. We selected the band through this site based on the variety of their song list and their sound clips – which some might consider risky. The band was very professional throughout the planning, the set-up, and finally the event. They were great. The song selection was great, their playing was great, and their enthusiasm was great. My guests loved the band and by the end of the evening they had begged the band for 3 more encores. Hands down one of the funnest bands to spend an evening with. It was an amazing night. Sorry for the delayed response! Things have been crazy with the wedding, then Thanksgiving, then honeymoon, then holidays & New Years – phew! Settling back down though. I want to let you know that Erik and I could not possibly have been more thrilled with Re-Mix BAND for our wedding. They set the tone perfectly from the start. We had a packed dance floor the entire night and they really kept the energy up. It was an awesome party… but too short! I would recommend them (or hire them again for other events) in a heartbeat. Thank you so much for the recommendation! Thanks again and please tell the band that it was truly an honor to have them play for us. I have to tell you that they also went past the 11:30 stop time which was much appreciated.